For the Governor’s Coordinator on Homelessness Scott Morishige and his small four-person team, homelessness is much more than numbers and a “Point-in-Time” count. Homelessness has a face and a name. It’s Sims Santa Anna, who used to live on the banks of Kapalama Canal. Or Jodi Jennette Inks, whose home was on the slopes of Diamond Head. Or the veterans on several islands who finally learned that the government can help them. And it’s the moms and children who have found their way to the Family Assessment Center in Kaka‘ako – resulting in permanent housing. As Hawai’i pivots from a state of emergency on homelessness to a long-term strategy, the governor’s homelessness team is pressing three “levers of change” to move people off the street and to help them maintain housing. The three levers are affordable housing, health and human services, and public safety. 5,000 people found or maintained housing – Statewide, this was the number of people who transitioned off the streets and/or maintained their housing — a more than 50 percent increase over last year. The speed of housing placements has doubled – In just the first month of the new state-funded shelter contracts, twice as many people are moving from emergency shelters into permanent housing to provide them with a more stable living environment. The Kaka‘ako homeless population has shrunk – More than 290 people from the previous Kaka‘ako encampment have transitioned into permanent housing. A new Family Assessment Center, focused on homeless families with children, is connecting folks to housing and/or services in an average of 73 days. 2,900 evictions have been prevented – The team has reduced the eviction rate of at-risk people by 25 percent through a public-private partnership between the Department of Human Services, Aloha United Way, and members of the legal community. Taxpayer dollars are being conserved – The “Housing First” approach, expanded to the neighbor islands in April, gets the most chronically homeless individuals off the streets and into stable housing. The data show that Housing First saves an estimated $55,080 per person per year in health care costs alone. This equates to more than $6.4 million saved each year. Housing First also breaks the cycle of homelessness by re-engaging people with the community, reconnecting them with family and job training. 1,000 landlords . . . and growing – Working with the Hawai‘i Association of Realtors, the team has helped coordinate landlord summits on every island to increase the inventory of low-income housing. Under the Ige administration, the Section 8 housing waiting list opened for the first time in more than a decade. Outreach paired with enforcement – When law enforcement must clear public lands, the governor’s team and outreach workers visit those populations to build trust and offer services. For example, the recent Diamond Head enforcement resulted in 38 out of 40 individuals getting services, including two veterans who had been homeless for 14 years and didn’t know they could use VA benefits. Through the state’s Hawai‘i Public Housing Authority, some 700 veterans have been housed since 2014. IT TAKES A VILLAGE: Scott Morishige, Erin Rutherford and Jay Parasco in the studio. 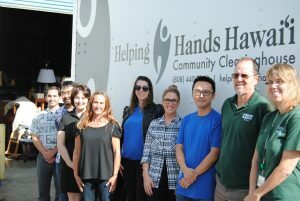 “The Road to Home” on KHVH-AM 830 from 7 to 8 a.m. Wednesdays – Want to learn more about the latest efforts to reduce homelessness? Then tune in during morning drive time to Rick Hamada’s radio show and a new segment, “The Road to Home,” on KHVH-AM 830 from 7 to 8 a.m. Wednesdays. 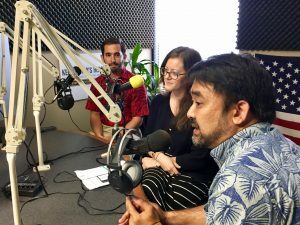 “The show will update listeners on progress, increase awareness and encourage people to call in with questions,” said Scott Morishige, the state’s coordinator on homelessness. The program emphasizes the collaboration between state, city and non-profits in helping homeless individuals and families find housing.